12 pp. (including wrappers) The covers depicts a servant bringing food to Aladdin and his mother. It is printed in red and black ink. There are 7 half page color illustrations. The book is a part of the Fairy Moonbeam's Series, which are "little fairy stories that have been household joys for generations." Binding is sewn. Measures 6 3/4" x 4 3/4"
. Missing surface litho on front cover. Minor toning due to age. 8 plates, Retells the classic story of "Ali Baba and the Forty Thieves",but, for young readers. The book comes with wonderfully colorful illustrations. The cover states that this book is a "Walter Crane's Picture Book Reissue". Book dated both by OCLC and inscription on cover. Measures 10 3/4" x 9"
24 pp (including covers) Retells the classic story of Sleeping Beauty. The book has rich in-depth color illustrations, four full page, and one double page. Measures 10 1/2" x 9". Covers partially detached. Offset litho between the center fold. Minor soiling and toning due to age. Minor faded penciling on back cover. One page has a very small (less than 1/2") tear, but it does not effect the text or illustration. illustrated applied cover, Image mock-up for book. Heavy card stock pages with illustrated color papers attached, each picture is of an animal and some pages are a collage of the habitat. 7 3/4" x 8 1/2"
12 unnumbered pp. Color illustrated cover, no. 52. Two young girls save a dwarf who tries to feed them to a bear. The bear becomes a prince and marries one of the girls, color illustrations by author. Measures 10 1/2" x 10". Center pages detached from staples. Some staple rust. 12pp. Softcover, front and back covers have a brightly colored illustration of Snow-White against a light blue background. Profusely illustrated, with 6 in-text illustrations, either 4" x 4 1/2" or 8" x 4 1/2" in size. This short story collection includes the story "Snow White and Red-Rose,", "Magpie's Nest," "Lambkin" they attribute to "East India", "Sleeping Beauty" attributed to The Brothers Grimmm, "Why the Bear Has a Stumpy Tail, "Three Little Kittens They Lost Their Mittens," and "The Hare and the Hedgehog," described as an "English Tale." Measures 10 1/2" x 12 1/2". 16pp. Softcover, front and back cover have a brightly colored illustrations of three children in a ship fashioned out of large clog and a patchwork blanket hung as its sail, floating against a dark starry sky - an image from the titular story "Wynken Blynken and Nod". "No. 319" printed in the bottom right cover. Profusely illustrated, with 5 full page, color illustrations and 7, half-page black and white illustrations. All illustrations by Fern Bisel Peat. Stories included are "Wynken Blynken and Nod", "The Naughty Doll", "The Straw Parlor", "Fairy and Child", "The Duel", "The Dinky Bird" and "Fiddle Dee-Dee". Measures 10 1/2" x 12 1/2" . Take the Children is an unique, interactive story, that involves the reader in a game. 24 pages. It is representative of Dorothy N. Knights signature style. Spiral bound litho on heavy paper covers. The book begins with six children from different lands boarding the ship. The children are actual die-cut 5 1/4" children dressed in regional attire from England, France, Italy, Holland, Switzerland and Norway. The objective is to insert the appropriate child in the slot in the map of his or her homeland. The last two pages show the children in their appropriate countries. 7 1/2" x 9 3/4".. In a shortened, and selected, retelling, Gullivers Travels becomes a story for even children to enjoy. 24pp. There are publisher advertisements on the back cover. Broken up into two chapters, "Gulliver's Voyage to Lilliput" and "Gulliver's Travels to Brobdingnag". The two chapters being contrasts of Gulliver being a giant and Gulliver being very tiny. It is full pages of text, and seven (7)full page, hand-colored illustrations to pair with it. The story remains recognizable and the format the same, but pared down and simplified for the children. Measures 8 1/4" x 6 3/4". OCLC - 5 Jan 2019..
12 pp (including wrappers). The cover depicts the sleeping princess after she is cursed. Cover printed in green, red, and black ink. The title page of the book has the full title as 'Sleeping Beauty in the Woods'. The alphabet is printed on the front and back interior covers. There are six color illustrations in the book. On one illustration, the name of the engraver, Jackson, is featured. A part of the Fairy Moonbeam's Series, which are "little fairy stories that have been household joys for generations." Measures 71/2" x 5 1/4". Edge wear. Missing surface litho on front cover. Tape repair on binding. Sewing repair with red string, the dye in the string has caused some minor staining. There is a small circular brown stain that continues through several pages. Softcover, illustrated in bright color: front and back cover have the same drawing of the titular character Little Black Sambo, wearing his distinct bright orange shirt, blue pants, purple shoes, and carrying a green, polka-dot umbrella, illustrated by Fern Bisel, Peat. Bottom left corner has "No. H-105" printed in small black type. Profusely illustrated, with 7 full page, color illustrations, and 6 pages with large, in-text illustrations in black-and-white. This book includes the stories 'Little Black Sambo', 'Black Mumbo', 'Black Jumbo' and 'the four Tigers' [sic]. Last page has a short biography of the author, and gives details about the story's origin and this book's creation. States that this book is to be used in an educational setting, and the typeface has been chosen based on studies about how to develop "the correct eye movements." Children are also encouraged to color in the black and white illustrations. 14pp. 9 1/4" x 13". 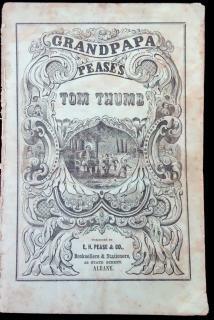 Grandpa Pease's Tom Thumb. E. H. Pease & Co.Albany, NY. 8 leaves, green paper wrapper with small illustration of children playing in a park surrounded by large decorative elements. Hand colored illustrations throughout. half-page illustrations and two full-page illustrations. Back cover has a list of "Popular Games and Toy Books for Young People" also published by E. H. Pease & Co. Measures 10" x 7".. The picture book has the letters of the alphabet on the inside front and back cover, as well as numbers 0-9 both in Roman and Arabic numerals. 12 page. The book is written in the French language, and has short descriptions of a variety of animals. Some of the animals featured are Zebu, Zebra, Black Bear, Brown Bear, Ostrich and Kangaroo. Each animal gets a full page illustration, four (4) are in color, along with a short paragraph of text that gives some basic facts. Measures 8 1/4" x 6". OCLC -0 Jan 2019. .
85 pp. First American edition with blue paper boards applied stamp. here are 27 color illustrations that wonderfully depict the mischievous behavior of Tom Kitten and his siblings as they get into trouble. Potter, as was normal for her, took inspiration from the landscape and animals around. Beatrix Potter is the always dependable creator of captivating children's book, and this one is no exception.5 1/2" x 4" . N.B. This copy sold as Lot 46 at Christie's East, the Doris Frohnsdorff Collection, April 16, 1997. Large folio with title page and thirteen silk screen prints by Tobias Schneebaum tipped on to heavy card stock with printed text by Vance Bourjaily at base. Loose pages housed in red printed folio, no. 250 of 1500, not signed, vibrant colored abstract illustrations. The humorous tale of a young girl and the unique and abstract items in her life; "kidney-shaped playpen" "British sports carriage" then the encounter with her "reactionary Grandmother." 85 pp. 27 color illustrations that seem to hop right off the page. Original green-gray paper boards and the color pictorial endpapers with various story characters. First American edition. The Beatrix Potter classic story about a frog that just wants to catch a couple minnows, but ultimately just catches a lot of trouble. .From the illustrations to the text, this book is imbued with the whimsy of Beatrix Potter. 5 1/2" x 4". 85 pp. Green paper on board with applied stamp of dressed goose. 27 color illustrations. Color pictorial endpapersThis classic, first American edition, tale by Beatrix Potter is a charming story, with just that hint of mortal danger, exactly as can be expected from her. 85 page. The story of Jemima's determination to take care of her own eggs, when things goes awry. 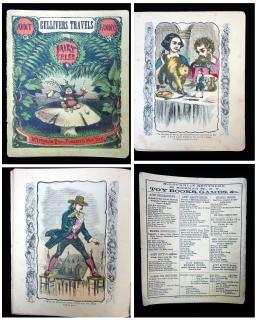 Original green paper boards cover and color pictorial endpapers depicting characters from her other stories. This short story is a great representation of Potter's work and all around skill. 5 1/2" x 4". Provenance: Christie's East. Beatrix Potter. The Doris Frohnsdorff Collection. Original Drawings, Autograph Letters, first Editions and Epphemera. Wednesday, 16 April 1997. 85pp. Green paper on board with applied litho label. Color frontispiece of dancing couple in period costumes). 26 colored illustrations. The classic Beatrix Potter story about a nice tailor and thread wielding mice who repay his kindness. It was one of Potter's personal favorites of the stories she has written. First American edition. The illustrations, with fully clothed mice and coated cats, represent all the hallmarks of Potter's illustrative work and adds great visuals to a sweet story. Dark green paper boards. 5 1/2" x 4".. Inscription on title page, given as a Christmas gift 1903. Provenance: Christie's East. Beatrix Potter. The Doris Frohnsdorff Collection. Original Drawings, Autograph Letters, first Editions and Epphemera. Wednesday, 16 April 1997.